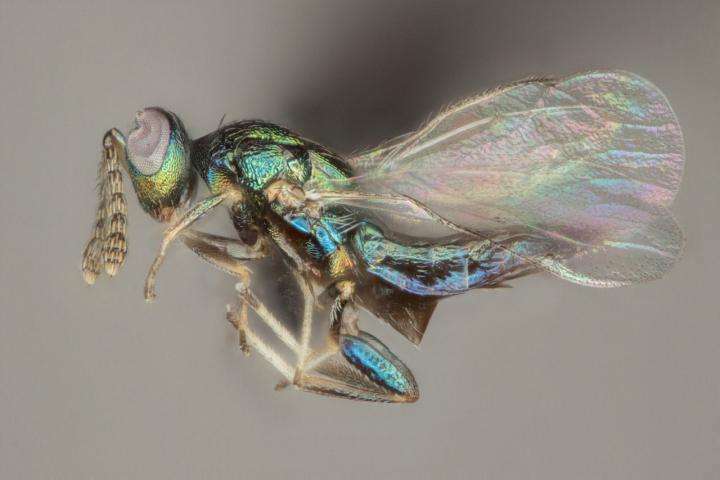 Gall wasps may feel confident as they infest oak trees for shelter and sustenance, but their wasp enemy has an even more insidious agenda, according to Rice University scientists. The wasp known as Euderus set, or E. set, deposits an egg in the developing gall wasp's woody haven. The young E. set eventually chews its way to freedom - through its host's head. 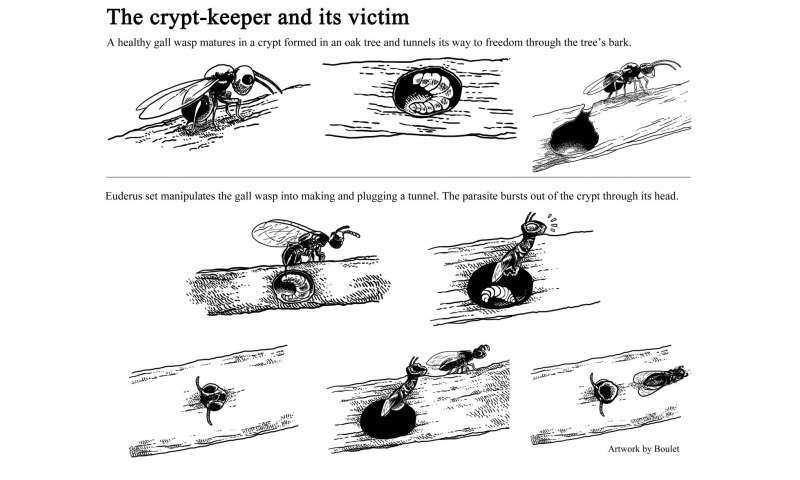 Rice researchers nicknamed it the "crypt-keeper" wasp and said it's a rare example of hypermanipulation, in which a parasite is manipulated by another parasite. E. set and its gory emergence are described in two papers led by Rice evolutionary biologists Kelly Weinersmith and Scott Egan. The first paper, in the open-access journal ZooKeys this month, describes the new wasp species in detail. The second, released today in the Proceedings of the Royal Society B, details the species' ghoulish strategy. The discoverers named their wasp for Set, the Egyptian god of evil and chaos who trapped his brother Osiris in a crypt, killed him and then cut him into little pieces. The tiny, iridescent parasite hijacks its host, Bassettia pallida, which would normally mature inside the crypt (aka the gall) and tunnel its way out to freedom in the spring. A female E. set deposits an egg into the crypt, where it manipulates the growing gall wasp, typically making its emergence hole too small. When the wasp tries to escape, its head lodges in the hole. E. set can then consume the gall wasp's internal organs and emerge, "Alien"-like, from its head case. "It could be the parasitoid cues hosts to excavate early, but makes them do it less well than usual," said Weinersmith, who studies parasites. "They only go part way and then they get stuck. "That's what I love about parasite manipulation of host behavior," she said. "So many of the stories that have been uncovered are just as cool as the coolest science fiction movie." Egan originally discovered the wasp on the Gulf Coast of Florida in the summer of 2014 before finding it in trees at Rice and in an oak tree in his front yard. As part of this study, E. set has now been found in Georgia, Mississippi and Louisiana. "I was walking on a path through the sand dunes with my daughter that summer while on a family vacation and of course, I can't not grab bugs everywhere I go," said Egan about spotting a tree branch of interest. "It ended up being this rare cynipid (gall wasp) that I don't see around here very often, and in a much higher density. Then I couldn't stop myself." Weinersmith first saw it while chatting with Egan during one of their initial meetings at Rice. "He had this cup of stuff on his desk," she recalled. "Anytime Scott sees a gall, he cuts it off, sticks it in a cup, puts a coffee filter over it and waits to see what emerges." "A couple of weeks later, animals started coming out," Egan said. "I did some dissections, shaved off the head with a razor blade, got into the wood and in the belly of these beasts was another little tiny larva, sitting in the abdomen. I immediately called Kelly." The researchers hope to discover how E. set triggers the change in Bassettia's behavior. "One hard thing is that we can't see what's happening until they come out," Weinersmith said. "We're talking to people to see if we can CAT scan the branches in various stages." But they already know how badly E. set needs its host. To see how well it could tunnel, they taped thin strips of bark over the dead heads and waited. The experiments showed the crypt-keeper was about three times more likely to die in the crypt if it had to dig through the head case and the bark. Because close to 600 species in the Eulophid family are found in North America, and many attack or serve as biocontrol agents for agricultural pests, the researchers would also like to know if E. set's manipulations are more common. 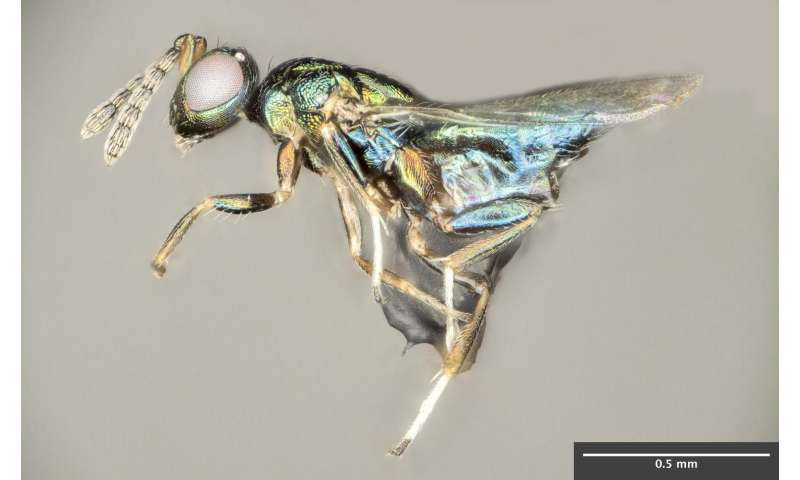 "Euderus set represents one of many millions of undescribed parasitic wasps with peculiar lifecycles," said Andrew Forbes, co-author on both papers. His lab at the University of Iowa studies the evolution of parasitoid wasps, which he described as one of the most species-rich groups of animals on the planet. Weinersmith noted the gall wasp victim is hardly unknown. Literally millions of specimens are in the possession of the American Museum of Natural History, most brought there by the entomologist Alfred Kinsey, who later earned renown for his human sexuality research. "Scott was going through some of those museum samples and saw this phenomenon in those branches," she said. "So it's been in museums for years, there for people to see. But we couldn't find any evidence that other people noticed this phenomenon and thought, 'Maybe something weird is happening here.'"